To a higher degree than the muse or the angel, the duende seizes not only the performer but also the audience, creating conditions where art can be understood spontaneously with little, if any, conscious effort. Duende is an ecofriendly leather handbag and accessories company that specializes in hand dying techniques applied to natural vegetable tanned leathers. Ecofriendly leather and hand dyed leather is a rare commodity in the handbag industry at this time. Duende plans to revitalize the quality leather goods of the past with a southern charm, while maintaining true to the ecofriendly values of the future. Duende handbags are locally crafted in the small southern college town of Statesboro, Ga. Through a collaboration with Georgia Southern University's Fashion Design Department, we provide students the opportunity to complete internships with duende. Your purchase of this quality American made good supports the cultural development of small rural communities and colleges in the South. Unlike other local handbag boutiques, Duende can not only claim locally made...we can also claim ecofriendly processes from livestock to handbag. Inspired by microbiology and the celebration of life, each marbleized pattern mimics many microscopic life forms and cell structures. The beauty of the microbiology influenced patterns can be understood across all cultural boundaries. We believe these patterns of life present in the marbling embody the definition of Duende. To this day, Duende is a Spanish word that does not directly translate to any other language. The owner and designer, Lynsey Johnson, is a Statesboro native that grew up roaming the Ogeechee River banks as a small child. She still resides locally in a cabin along the Ogeechee River, where the designs first began. With a background in environmental biology and fashion design, she has merged the two philosophies to develop a homegrown, ecofriendly handbag line. Our products are hand crafted in America from 100% USA sourced vegetable tanned leather, solid brass hardware, and Eco-Flo leather dye. Each handbag is unlined because we are proud of our high quality leather and want every inch to be visible. 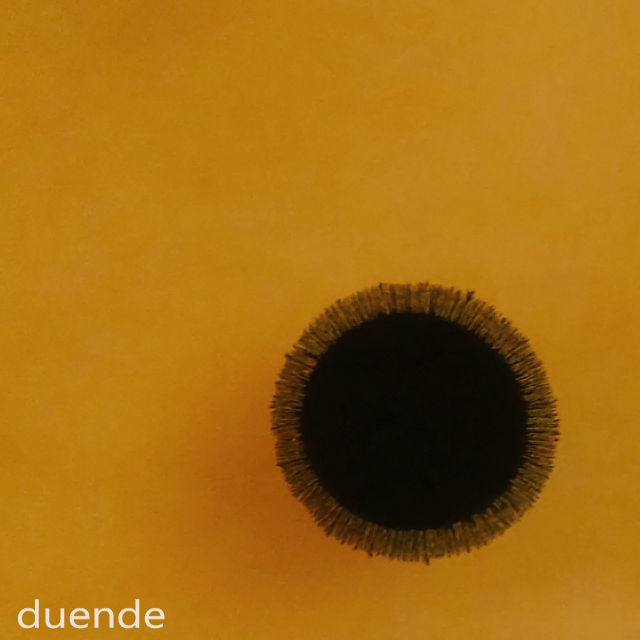 In the spirit of Native Americans, Duende utilizes all parts of the cow hide and wastes no by-products. Marbling originated in Persia in the 1400s and was known as Ebru art. The exact formula and inventor is lost. As the process moved from city to city through Turkey, Spain, and the rest of Europe, each individual adapted the method to create a unique appearance and changed the materials and recipes over time. During this time, the recipe was a guarded secret with no written instructions, this general attitude still exists today, which is why it still remains an esoteric craft. Along the way as the methods changed throughout history, hundreds of anonymous artisans sweated away countless hours trying to re-invent the process. This process is still going on and today in the USA there is still a small group of experimenters seeking the perfect marbling method. The basic technique is to float paints on the surface of a medium where they are manipulated and transferred. The unique design is created by the artist's movements as the paint hits the medium, the qualities of the paint, chemical properties of the medium, temperature, emotions, the weather, and who knows...and this is why each and every marbleized product is one of a kind. I have created my own method of marbling which is unique in that it takes on the appearance of cells, micelles, and bacterial growth in petri dishes. I have adapted microbiology techniques to create this variation in marbling that reflects my story and maybe just a little of the story for cell division and life as we know it. Each marbleized panel is unique and cannot be reproducible in the original form leaving the wearer confident that they own a one of a kind handbag. There are several methods for tanning leather today, but not all of them are a good choice for your health and for the environment. I will first describe two commonly used methods, and then a third one, used on Duende products, the vegetable-tanned leather. The chrome-tanning is the most popular and controversial, for its widespread use in the fashion industry. It is effective and fast (within a few days) to produce a soft and uniform leather. Its raw appearance, before it is dyed and painted, is pale-blue in color and with a strong chemical smell that normally remains in the final product. But the use of chromium salts is harmful to the human and environmental health, it is a carcinogenic, persistent and indestructible chemical. Despite being publicly recognized for these major downsides it is still the most popular method in the industry. The aldehyde-tanning is advertised as the "chromium-free" method and mainly used in the automotive, clothing and footwear industry, and its raw appearance is very pale, almost white. But the formaldehyde, base chemical in this process, is dangerous and the toxicity of the resulting leather should be strictly controlled, which does not always happen when the industry is rushing for big fast results. The vegetable-tanning is truly "chromium-free" and does not have any other harmful chemicals. It is an old-world and artisanal process that takes advantage from the tannic acids found naturally in some plant species, by using the barks, branches, leaves and even some fruits in some specific techniques. The natural appearance, before painted, has a slightly brownish tinge on a beige color, with a natural, woody and earthy smell. So why choosing vegetable-tanned leather goods? Because you will be forward thinking and more responsible. You will be a conscious buyer, aware of your impact in the society and the environment. You choose the true origin of your belongings, without the usual multinational corporate cloaks fogging up your judgement. You acquire a natural canvas to record your life experiences, you will remember and will love to tell its stories. The African Springbok is the national animal of South Africa and considered to be one of the few antelope species with an expanding population. Springbok is also one of the only furs that is tanned naturally without the use of chrome, as compared to hair-on-hide cow, which is currently only available with chrome processing. You can feel comfortable knowing you have purchased a fur accessory that is not only derived from a free ranging animal with an expanding population, but it is also tanned with vegetable extracts in the eco-friendly methods duende stands by. Produced by Sean Gallagher http://gallagher-photo.com Funded by The Pulitzer Center http://pulitzercenter.org On the banks of the Ganges River in northern India, lies the city of Kanpur. It has become one of the most important cities in India as its leather industry has grown and it is now the biggest producer of leather products in the whole country. First established in the mid 19th Century, the city’s leather is exported across the world, with 95% of its leather destined for western markets including those in the US, UK and Germany. This success is coming at great environmental and social costs that are destroying the local Ganges River ecology and scarring the local people in the form of life-threatening illnesses. The city is now notorious for having some of the country's worst water pollution which has been created by the leathery tannery industry which discharges waste water laced with toxic chemicals, such as chromium, freely into local waterways. This water is used by local people and is channeled onto local farmland, subsequently poisoning the soil, entering the food chain and accumulating in local ecosystems. At greatest risk are the people who work in the tanneries and farmers who work daily with the toxic, and highly acidic water. An array of health problems now afflict locals who are suffering as a result of the bioaccumulation of dangerous toxins over the past decades. Health problems include cancers, mental health problems, child development issues and skin diseases.